Brakes are arguably the most important part of a car. 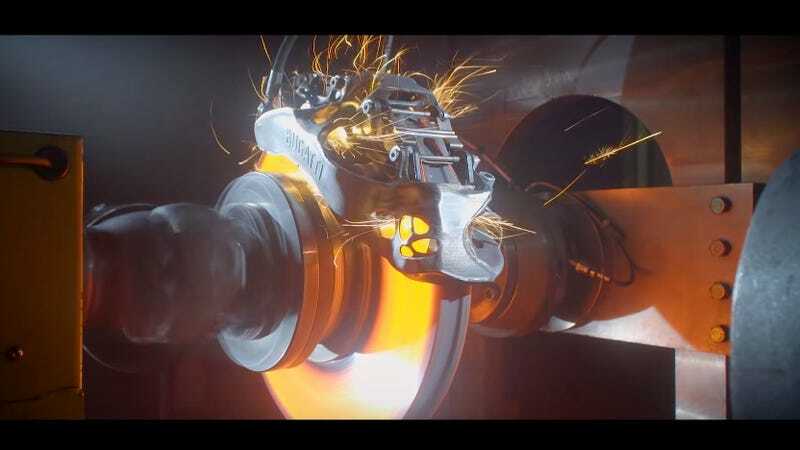 Bugatti, a company that makes big and fast toys for very wealthy people, is testing out its 3D-printed brake caliper for production—and it’s actually wild to watch. Once complete, the full caliper housing is heat-treated in an oven heated up to 700 degrees Celsius (nearly 1,300 degrees F)... the caliper is then taken through a few long processes to ensure a smooth and bright finish. If that all sounds insanely expensive, it’s probably because it is. Yesterday, Bugatti released a video of its engineers testing the caliper. I’ve seen brake rotors light up under hard use plenty of times before, but it was something else to see a naked rotor do it. The sensors show that Bugatti was running the rotor at well over 200 mph and after braking, the rotor temperature shot up over 1,600 degrees Fahrenheit. Bugatti says this is an eight-piston, monoblock caliper and can apparently stop the Chiron from 100 mph in just 2.5 seconds. Damn. Take a look for yourself, and don’t get discouraged by the melodramatic beginning. The action stars about 30 seconds in.